From jeans to jodhpurs, step into classic comfort this season with the versatile Seychelles Exploring loafer. Nubuck or leather upper depending on colorway. Slip-on design. Softly squared silhouette with apron toe. Leather lining. Lightly cushioned insole. Micro heel. Rubber outsole. Imported. Measurements: Heel Height: 1 4 in Weight: 5 oz Product measurements were taken using size 9, width M. Please note that measurements may vary by size. Weight of footwear is based on a single item, not a pair. 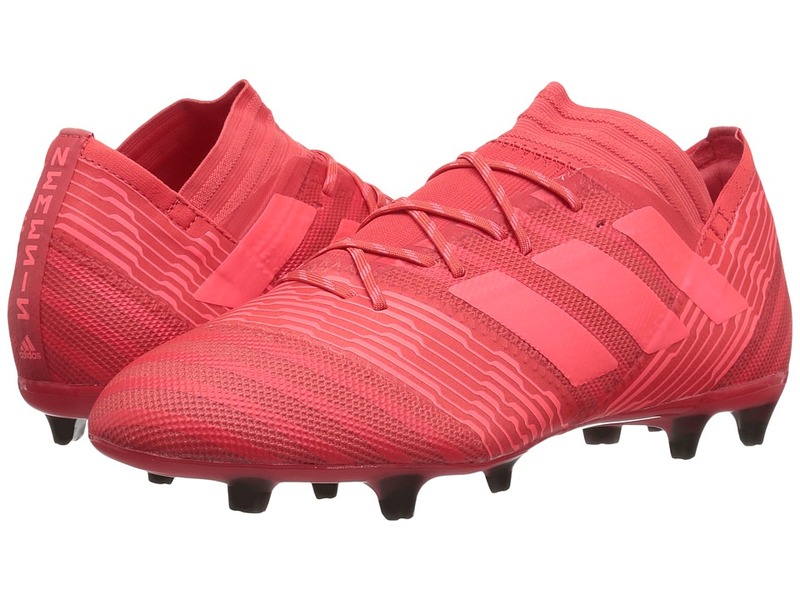 Take the field and dominate with the adidas Nemeziz 17.2 FG soccer cleat! Responsive touch with foot-hugging AGILITYKNIT uppers. 360 Torsion Tape offers lateral and medial support. Offers a bandaged fit with Torsion Tape. Elasticized instep and tongue for a snug fit. Traditional lace-up closure. Secure lockdown and ankle stability with a DUAL LOCK COLLAR. Explosive acceleration and direction change on natural grass with agility stud configuration. 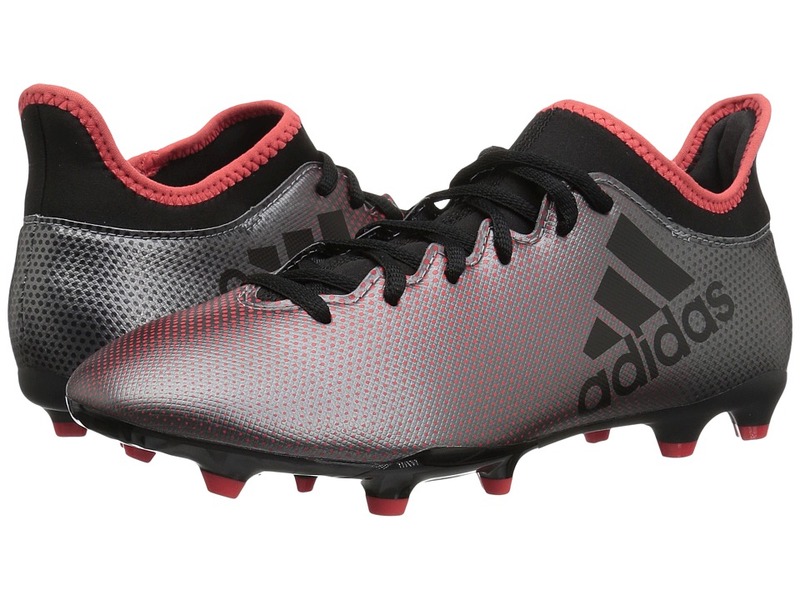 Synthetic outsole with cleats designed for firm ground. Imported. Measurements: Weight: 11 oz Product measurements were taken using size 12, width D - Medium. Please note that measurements may vary by size. Weight of footwear is based on a single item, not a pair. The adidas X 17.3 FG offers a lightweight and agile wear like no other! Soft Chaos Feel upper made of synthetic and textile materials. Features a techfit compression sock that molds to your foot for instant comfort, even right out of the box. High collar at heel for a comfortable and supportive fit. Traditional lace-up closure. Soft textile linings. Foam cushioned footbed offers added comfort. Durable synthetic outsole with cleats designed to provide traction on firm ground (dry natural grass). Imported. Measurements: Weight: 10 oz Product measurements were taken using size 11, width D - Medium. Please note that measurements may vary by size. Weight of footwear is based on a single item, not a pair. 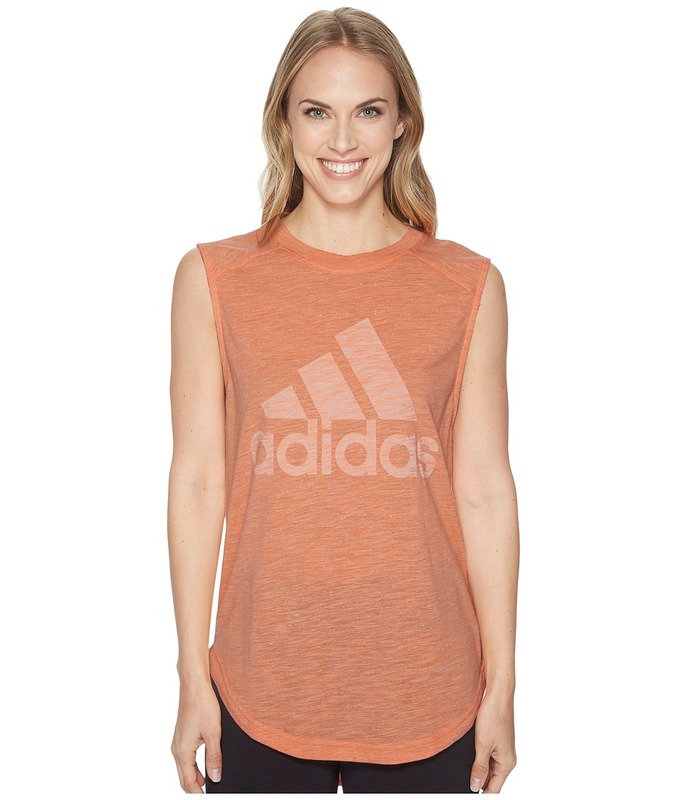 You look like a real winner in this adidas Winner Muscle Tank Top! Crew neckline. Wide sleeveless cut. Bold brand mark logo at front. 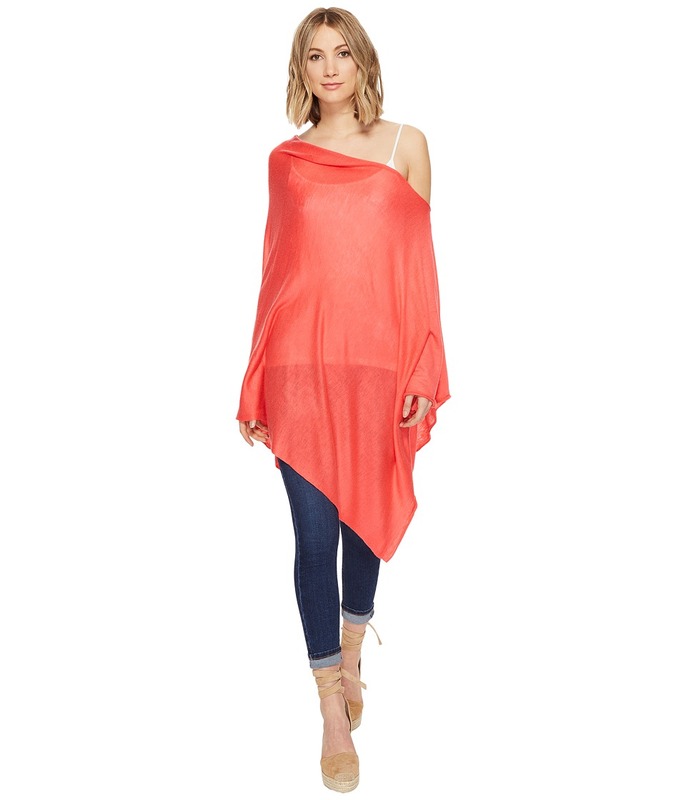 Longer length curved hemline gives you more coverage. 63 percent rayon, 35 percent polyester, 2 percent cotton. Machine wash, hang dry. Imported. Measurements: Length: 30 in Product measurements were taken using size SM. Please note that measurements may vary by size. 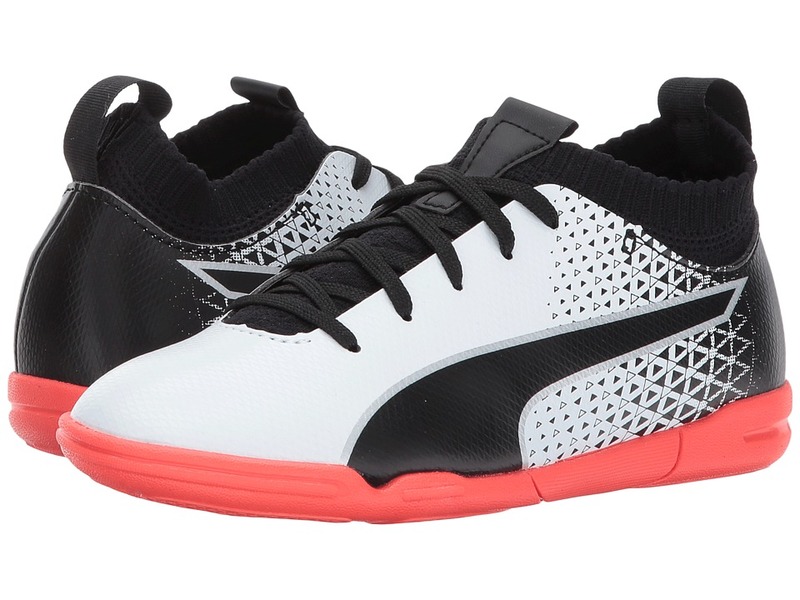 Keep their game moving forward with the versatile performance of the Puma Kids evoKnit FTB IT shoe! Indoor soccer shoe silhouette. A performance shoe for players of all levels. The upper features a knitted collar construction which ensures a unique silhouette and a premium fit around the ankle. A durable synthetic upper material combines lightweight comfort and longevity. Textured PUMA formstripe at lateral side. Non-marking rubber outsole. Recommended for indoor and turf surfaces. Imported. Measurements: Weight: 6 oz Product measurements were taken using size 2 Little Kid, width M. Please note that measurements may vary by size. Weight of footwear is based on a single item, not a pair. They~ll be set for big things when they lace up with the game-ready Puma Kids ONE 17.4 cleat! 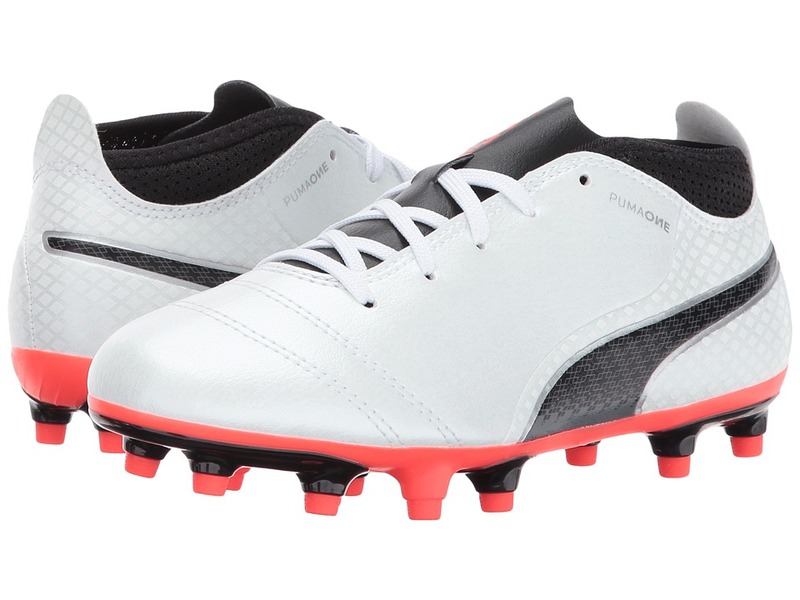 A performance soccer cleat closely following the design direction of the PUMA ONE shoe. Synthetic upper material provides lightweight and durable wear. Sock extension creates comfort and fit. EVA midsole. Suitable for use on firm ground. TPU outsole with conical studs. Imported. Measurements: Weight: 5 oz Product measurements were taken using size 2 Little Kid, width M. Please note that measurements may vary by size. Weight of footwear is based on a single item, not a pair. 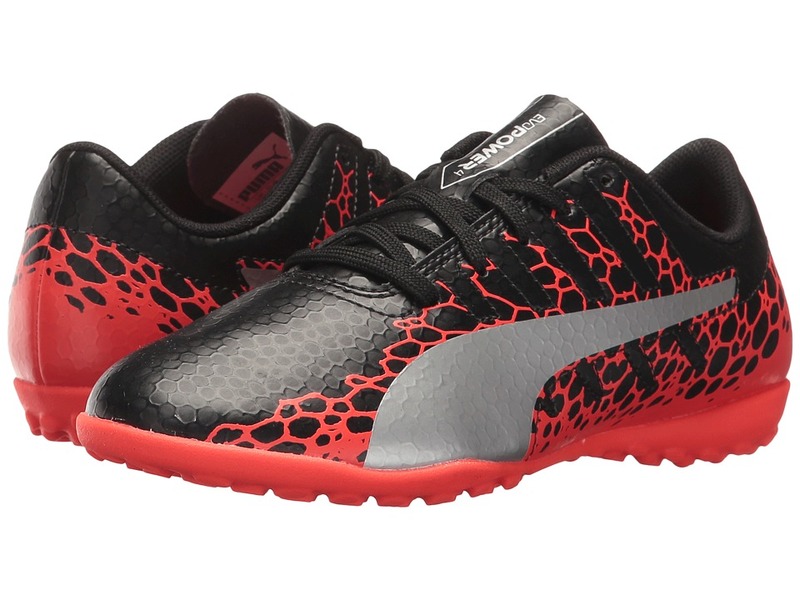 Step up to the challenge with the Puma Kids evoPower Vigor 4 Graph TT synthetic turf soccer shoe! Only suitable for synthetic grass surfaces. Synthetic upper is durable and soft. Stylish allover print. Centralized lace-up closure for a snug, secure fit. Thin tongue for a no-nonsense wear. Mesh lining offers a breathable wear in shoe. Puma formstrip along side. Youthfit insole is kid-friendly and made to accommodate growing feet. Solid, soft rubber outsole with multi-stud traction. Imported. Measurements: Weight: 6 oz Product measurements were taken using size 2 Little Kid, width M. Please note that measurements may vary by size. Weight of footwear is based on a single item, not a pair. 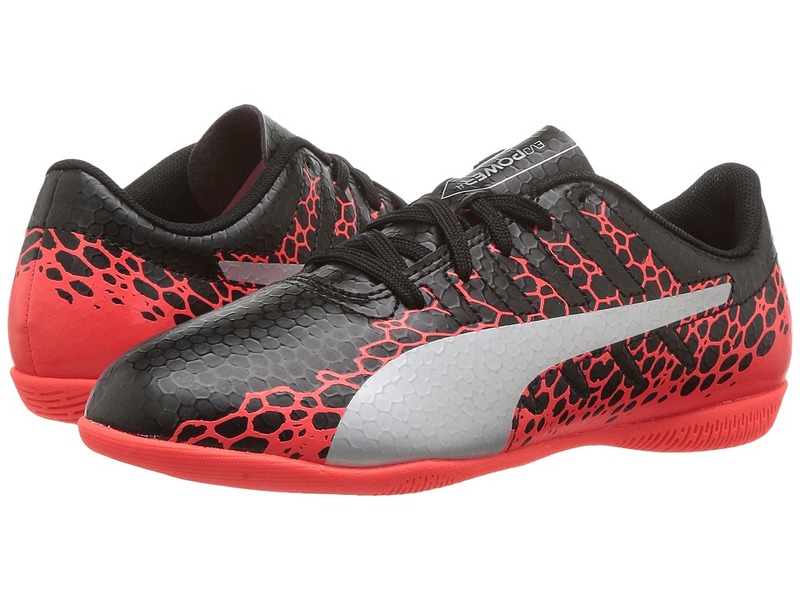 Step up to the challenge with the Puma Kids evoPower Vigor 4 Graph IT indoor soccer shoe! Synthetic upper is durable and soft. Stylish allover print. Centralized lace-up closure for a snug, secure fit. Thin tongue for a no-nonsense wear. Mesh lining offers a breathable wear in shoe. Puma formstrip along side. Youthfit insole is kid-friendly and made to accommodate growing feet. Non-marking synthetic outsole. Imported. Measurements: Weight: 5 oz Product measurements were taken using size 2 Little Kid, width M. Please note that measurements may vary by size. Weight of footwear is based on a single item, not a pair. 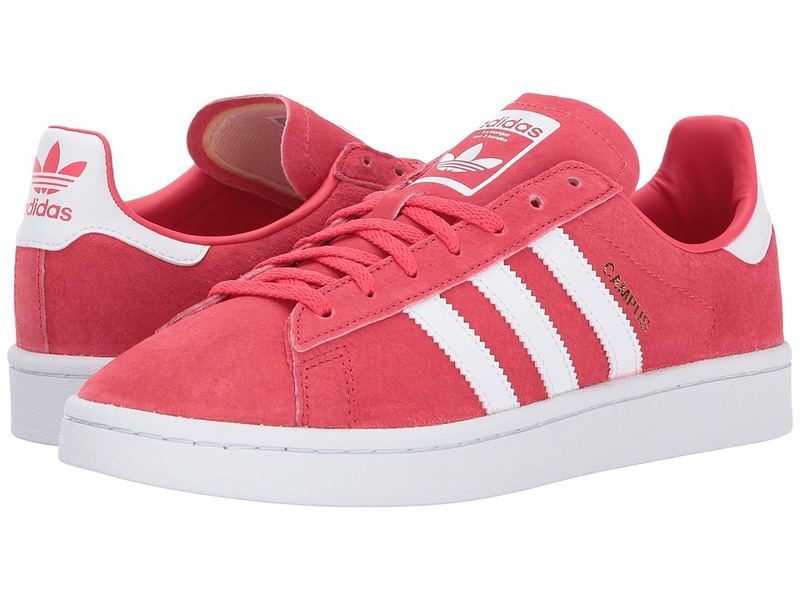 Be the cool kid on Campus with these street-chic sneaks. 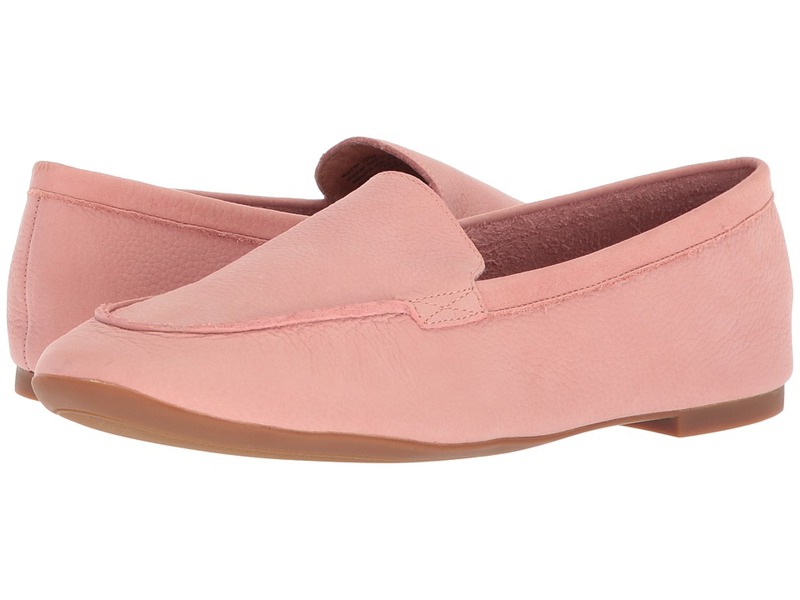 Soft suede uppers with a round toe. Lightly cushioned tongue and collar. Traditional lace-up closure. Smooth leather linings. Foam cushioned footbed offers added support. Durable rubber outsole. Imported. Measurements: Weight: 12 oz Product measurements were taken using size 8.5, width B - Medium. Please note that measurements may vary by size. Weight of footwear is based on a single item, not a pair. 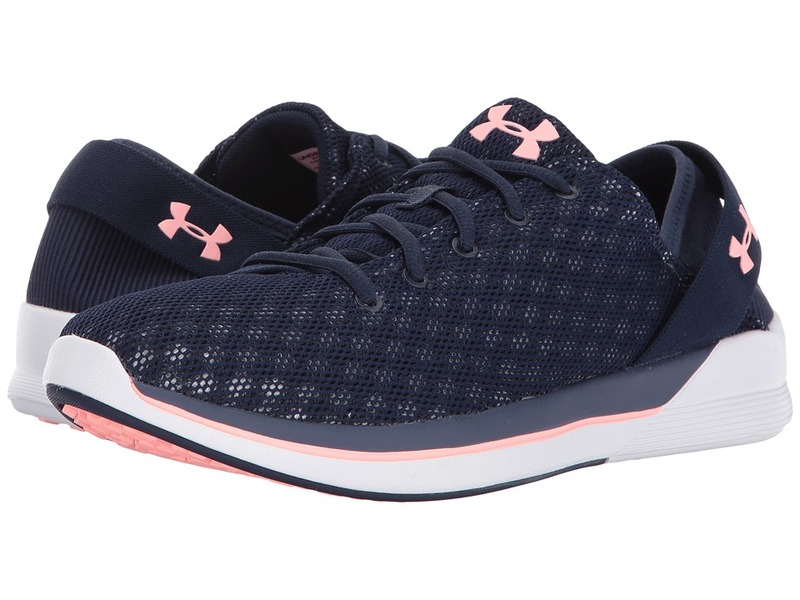 Take those intense training days to the next level with the versatile Under Armour UA Rotation shoe! Breathable textile and synthetic upper materials. Lace-up closure. Padded tongue and collar. Breathable fabric lining offers a great in-shoe feel. Molded foam insole. Midsole provides impact protection. Lightweight, durable EVA outsole for reliable traction. Imported. Measurements: Weight: 8 oz Product measurements were taken using size 9, width B - Medium. Please note that measurements may vary by size. Weight of footwear is based on a single item, not a pair. 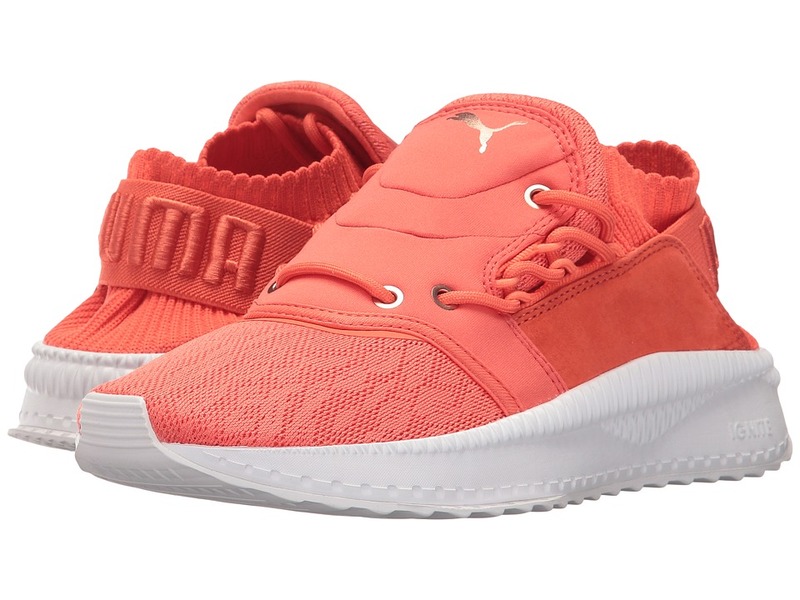 Take your training routine to a whole new level with the trend-setting Tsugi Shinsei sneaker. Knitted mesh upper for breathability and leather side panels. Innovative shield vamp puts the speed lacing on the sides. Fully knitted sock construction for lightweight, form-fitting comfort. IGNITE FOAM insole cushioning. Durable rubber outsole for grip. Imported. Measurements: Weight: 9 oz Product measurements were taken using size 8, width B - Medium. Please note that measurements may vary by size. Weight of footwear is based on a single item, not a pair. 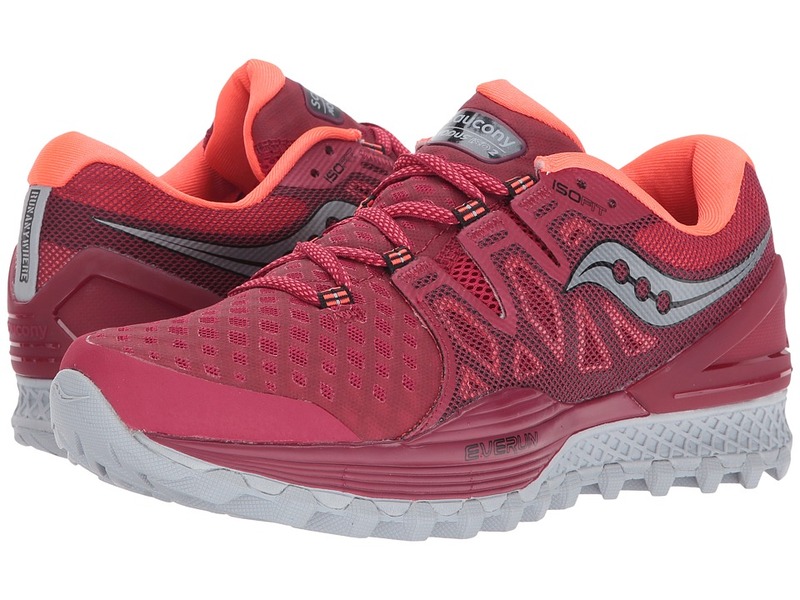 Get a smooth and fluid stride with the Saucony Zealot ISO 3. Predecessor: Zealot ISO 2. Support Type: Neutral. Cushioning: High energizing cushioning. Surface: Road. Differential: 4mm. Engineered mesh uppers offer an adaptable fit. Durable and lightweight FLEXFILM overlay on uppers provides a seamless and flexible wear. Lace-up closure. Plush tongue and collar. Breathable textile linings. Foam cushioned footbed offers added support. Features a molded heel collar that locks down the heel for a secure fit. Heel/Toe: 26mm/22mm. New ISOFIT design offers a more dynamic and adaptive fit at midfoot. EVERUN topsole supplies heightened energy return and lasting cushioning. New TRI-FLEX outsole delivers more flexibility in the forefoot and a smooth transition. Rubber outsole. Imported. Measurements: Weight: 8 oz Product measurements were taken using size 8.5, width B - Medium. Please note that measurements may vary by size. Weight of footwear is based on a single item, not a pair. Rise and grind with the support and agility of the Xodus ISO 2. Predecessor: Xodus ISO 2. Support Type: Neutral. Cushioning: High energizing cushioning. Surface: Trail. Differential: 4mm. Reinforced, textile ISOFIT system across upper molds to the foot for a custom feel. A hot-melt vamp layer adds reinforced protection. 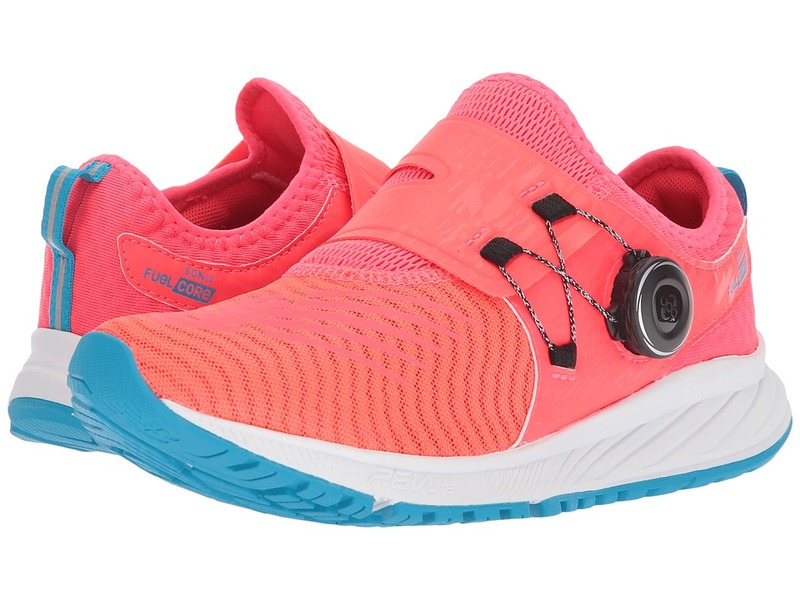 Features an external frame for added support, protection, and a lockdown heel fit. Lace-up closure. Plush tongue and collar padding. Breathable textile linings. Fixed, perforated, and cushioned footbed. EVERUN topsole promotes smoother landings in the heel and helps reduce pressure in the forefoot. Features a PWR TRAC outsole with tank tread protection for rugged durability and traction across tough terrain. Imported. Measurements: Weight: 10 oz Product measurements were taken using size 7.5, width B - Medium. Please note that measurements may vary by size. Weight of footwear is based on a single item, not a pair. 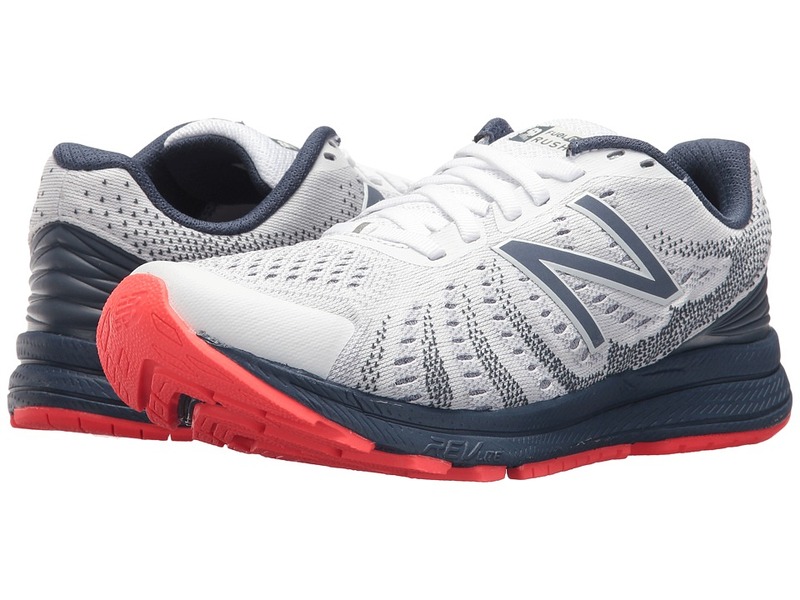 Stay on-stride with the second iteration of a proven running shoe. Predecessor: Fresh Foam Vongo. Support Type: Overpronation/Stability. Cushioning: High energizing cushioning. Surface: Road. Differential: 4 mm. Upper, midsole, and outsole technologies work together for a data-driven approach to mild stability. Breathable mesh and synthetic upper materials. Perforated mid-foot overlays provide smooth, structured flexibility. Lace-up closure. Padded tongue and collar. Breathable fabric lining offers a great in-shoe feel. Removable, molded foam insole. Lightweight foam midsole supplies the perfect blend of plush cushioning and support. Rubber outsole. Imported. Measurements: Weight: 10 oz Product measurements were taken using size 8, width D - Wide. Please note that measurements may vary by size. Weight of footwear is based on a single item, not a pair. Feeling a need for speed? The performance-boosting Sonic V1 takes your running game to another level. Predecessor: None. Support Type: Neutral. Cushioning: Lightweight, flexible response. Surface: Road. Differential: 6mm. Super-breathable and cooling air mesh uppers. Bootie construction with a stretch topline. Lightly padded tongue and collar. Features a Boa Fit System closure at the lateral side of the tongue strap for a secure and adjustable fit. Soft breathable linings. Foam cushioned Fuel Core insole. REVlite midsole foam provides lasting, responsive cushioning with every stride. Durable rubber outsole. Imported. Measurements: Weight: 8 oz Product measurements were taken using size 8, width B - Medium. Please note that measurements may vary by size. Weight of footwear is based on a single item, not a pair. 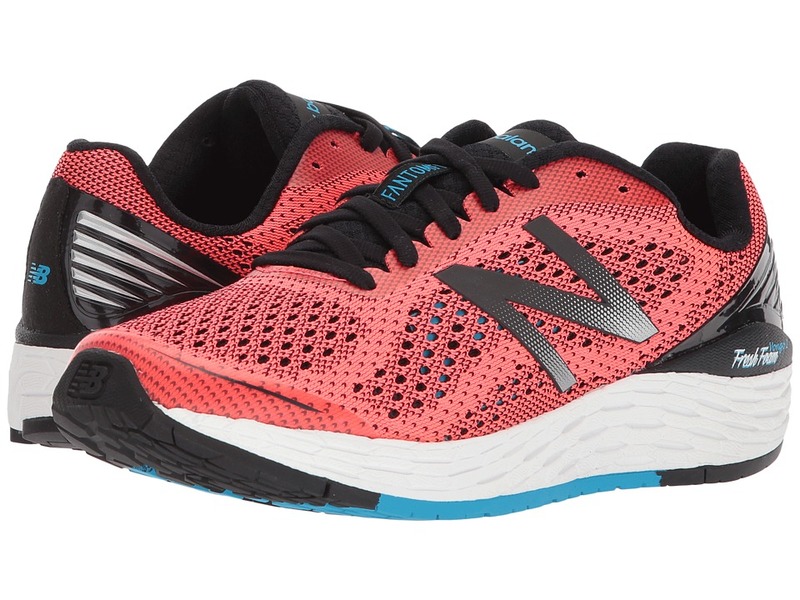 The lightweight and stability-enhancing New Balance Rush V3 will get you through your toughest workout routine. Predecessor: Rush V2. Support Type: Neutral. Cushioning: High energizing cushioning. Surface: Road. Differential: 6 mm. Breathable mesh and synthetic upper materials. No-sew upper construction helps reduce the likelihood of irritation. Lace-up closure. Padded tongue and collar. Soft and breathable textile linings. Fixed foam insole. 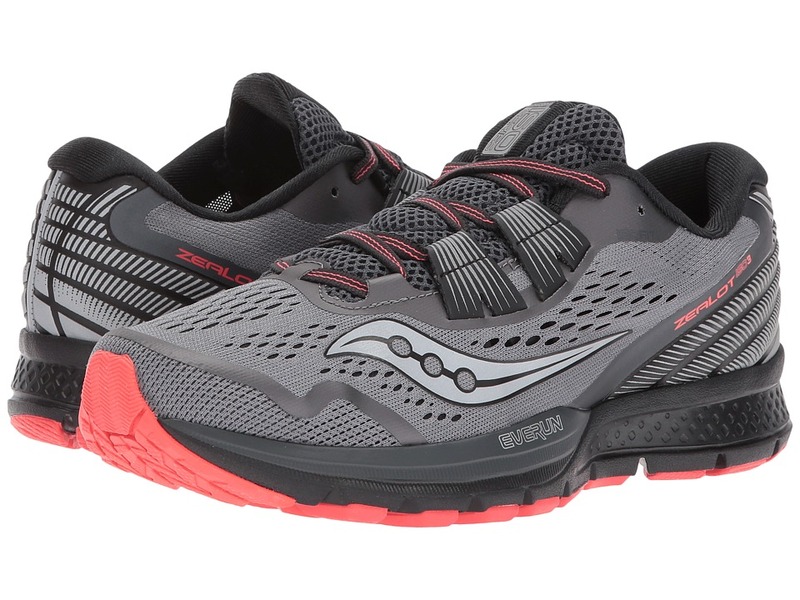 REVlite midsole provides a lightweight ride without sacrificing underfoot cushioning or stability. Durable rubber outsole. Imported. Measurements: Weight: 6 oz Product measurements were taken using size 8.5, width B - Medium. Please note that measurements may vary by size. Weight of footwear is based on a single item, not a pair. 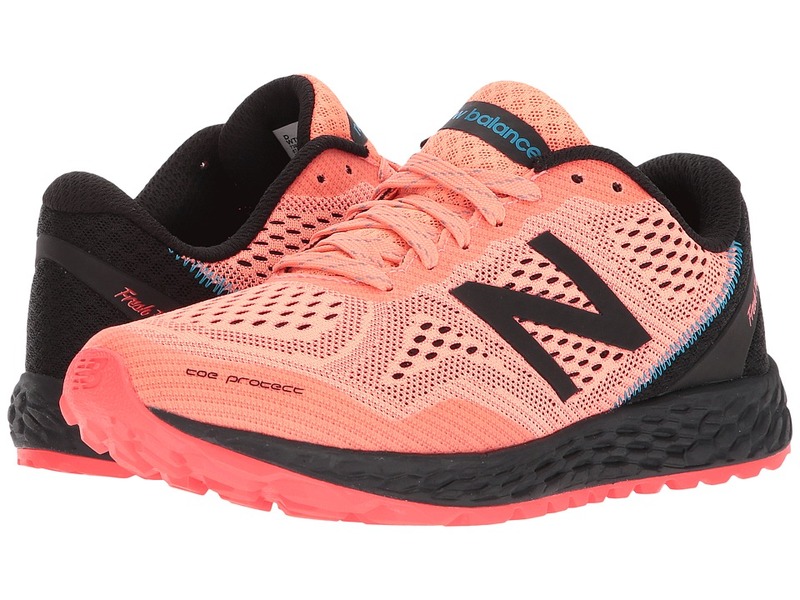 Kick up the dust as you head for the hills in the New Balance Fresh Foam Gobi v2 trail-running shoe! Predecessor: Fresh Foam Gobi. Support Type: Neutral to underpronation (supination). Cushioning: Light, flexible response. Surface: Trail. Differential: 6 mm. Breathable mesh and synthetic upper materials. Skeletal FantomFit upper supplies lightweight structural support. Lace-up closure. Toe Protect rubber toe overlay. Padded tongue and collar. Bootie construction for a comfortable in-shoe feel. Smooth fabric lining. Removable EVA foam insole. Single-piece Fresh Foam midsole delivers lightweight plush, and promotes a more natural ride. AT tread outsole utilizes both trail and running lugs for optimal traction over mixed terrain. Imported. Measurements: Weight: 8 oz Product measurements were taken using size 8, width D - Wide. Please note that measurements may vary by size. Weight of footwear is based on a single item, not a pair.